If you’ve never heard of Sirena Marine, look to the luxury motoryacht world, where the Turkish company is something of a powerhouse, having built more than 220 boats for Azimut Yachts. Now, with its partnership with Azimut scaling down and a world-class manufacturing facility at its disposal, Sirena is entering the U.S. market with a pair of well-built, stylish sport cruisers blessed with impeccable design pedigrees. We sailed the smaller of the two, the Azuree 46, on a gorgeous summer evening off Jamestown, Rhode Island. 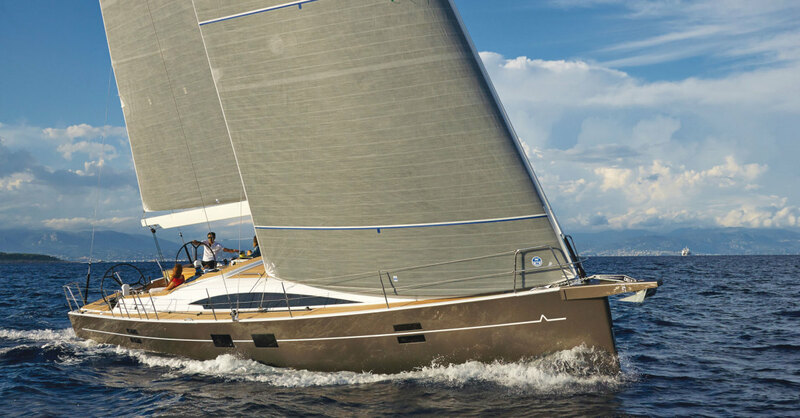 The Azuree 46 is from the pen of Rob Humphreys, the versatile Brit who has designed everything from luxury bluewater cruisers for Oyster to Volvo 70 and Open 60 ocean racers. Its purposeful lines reflect the latest in fast-cruising fashion: twin rudders, a pronounced hull chine, and a squared-off bow and transom. Draft is a healthy 8ft 6in, which will prove interesting in the Bahamas or on the Chesapeake. In open water, though, it will come into its own. The low-profile cabintop, with its semi-elliptical window treatment, combines with a graceful sheerline to make this a strikingly attractive boat. Its construction is sophisticated; hull and deck moldings are E-glass/closed-cell PVC foam composites, vacuum-infused with vinylester resin, except around the keel area where the laminate is solid. 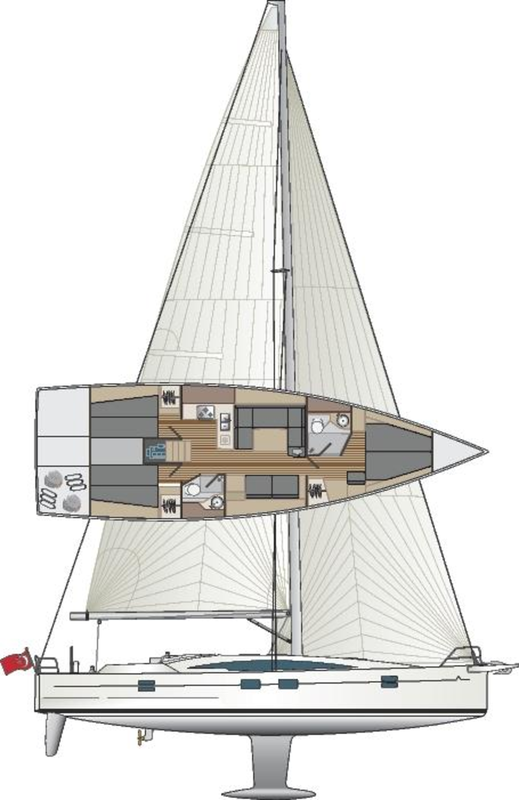 A structural grid, also vacuum-infused and reinforced with carbon fiber, is glassed into the hull floor to stiffen the boat and distribute the loads from the rig and lead T-keel. Bulkheads are laminated to the hull and deck. The fractional double-spreader aluminum rig (carbon fiber is an option) is by Seldén. accentuating the boat’s clean, classy looks. Forward, the anchor is housed in a fiberglass sprit that both keeps the rode well clear of the plumb stem and serves as a tack point for downwind sails. The anchor locker is capacious enough to house a windlass, rode, warps, a couple of fenders and the jib’s belowdeck furling drum. Fold-down mooring cleats add another touch of class and won’t snag wayward lines when under sail. All eyes, though, are drawn to the wide expanses of the cockpit. These will be best enjoyed at anchor, when the bench seats are converted to a pair of wide sunbeds, the transom gate is lowered to convert that squared-off stern to a swim platform, and a crew of six or more will have all the room they need to spread themselves out. Access to and between the twin wheels is easy enough, though the unwary might trip over the mainsheet traveler, which is not ideally located. Underway, the solid teak cockpit table provides an essential bracing point for seated crew, and the crew working the cabintop winches can stand securely just inside the companionway. The German mainsheet and genoa sheets are led to two pairs of winches just ahead of the wheels. This will be an easy boat to sail shorthanded. 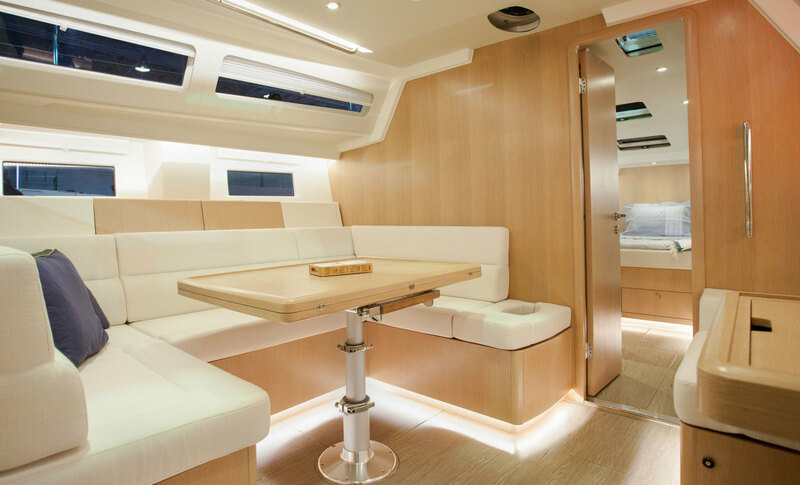 The boat’s interior design is by Sirena’s own team, which had plenty of volume to play with. The three-cabin, two-head layout works well for both passagemaking and living aboard in port. The light oak trim on our test boat combined with the natural light flooding in through the deck hatches, hull ports and those long cabintop windows to create an exceptionally airy feel. There is 6ft 4in or more headroom throughout. One of the twin aft cabins can be converted to a single berth with ensuite head, and you can have a dedicated aft-facing nav station instead of the convertible table on our test boat. However, that’s about it in terms of options, aside from trim, upholstery and the usual long list of systems extras like air conditioning, generator, bow thruster and so on, most of which were present on the test boat. The master cabin is forward, where the owners get the benefit of a roomy berth with good ventilation via the forehatch, lots of stowage space in lockers and under-bunk drawers, a clever pull-out vanity table, and a generously proportioned head/shower compartment. Aft, the second head is smaller but well-appointed. The saloon seating was obviously designed by someone who has put in some sea time; no annoyingly curved settee here to force the occupants’ knees together, just angles that let you wedge yourself into a corner when the going gets bouncy. Six could eat in comfort at the large table, more if they were skinny; the table itself drops to form a double berth. Our test boat had a convertible nav table opposite that can be dropped to form yet another berth. The cook will need a bum strap when preparing food or tending pans at sea, as there is little to brace against in the L-shaped galley. That aside, there is a generous amount of stowage and adequate counter space, especially when the cover is pulled over the three-burner propane stove. With a separate Isotherm fridge and freezer, there is plenty of cold storage for prolonged cruising. About the only thing not up to par was the rather shallow sink. I was happy to see long, sturdy stainless steel grabrails in the saloon, something often not provided on boats purporting to be ocean cruisers. I also liked the well-laid-out engine bay, with all service points easily accessible, the LED accent lighting, and the expert systems installations. If there’s one thing the current generation of twin-rudder-and-chine boats have in common, whatever their other differences, it is that once they are heeled and the chine is immersed they feel as though they are running on rails. The Azuree’s Jefa steering felt fingertip-light and positive in the light airs of our Tuesday-night race. Hard on the wind, the best speed I saw was 6.7 knots in 8 to 9 knots of true wind. The small genoa was a breeze to tack, especially with the test boat’s electric Harken winches. I used to think these were for wimps, but now I wouldn’t be without them on a boat this size. Beamy, broad-sterned boats can be a little sticky sailing dead downwind in light air, and the Azuree, though by no means a slouch, just managed to stay ahead of a pursuing pack of smaller boats while sailing wing and wing. In its defense, the boat was weighed down with full tanks and a lot of heavy optional gear. We also found later that she had come from the factory with an undersized headsail. Once around the leeward mark she put her shoulder to the breeze and took off, leaving the chasing gaggle in her wake. The Azuree’s performance ratios and polars promise an exhilarating turn of speed in a decent breeze. I thought the cockpit layout was very good, though some sailors won’t like having the traveler between them and the winches, and its sheer width would feel daunting in an Atlantic gale. Sightlines over the low coachroof were excellent. The only annoyance was the need to stoop under the bimini, whose frame was about 3in too short. The test boat was equipped with a naturally aspirated 55hp Volvo diesel swinging a Flexofold folding prop. The green powerplant easily drove the boat at hull speed. Lacking a central rudder for propeller wash to act against, twin-rudder boats can be a handful in tight quarters, so the optional retracting bow thruster will be popular. The engine bay is well soundproofed, and on deck only the slightest rumbling gave notice that the engine was in fact working. An Azuree 46 placed highly in the recent Caribbean 600 race, proving that its sporty looks are backed up by genuine pace and power. At the same time, its accommodations lack nothing in terms of cruising comfort, and it’s easy for a small crew to handle. Fast, pretty and well built, this is a lot of boat for the money.